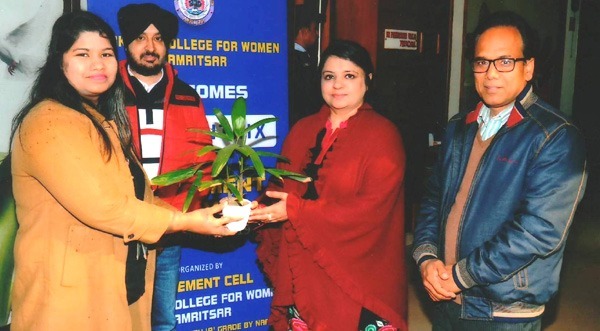 The placement cell of BBK DAV College for Women, Amritsar organized a campus placement drive by Concentrix India (formerly IBM Daksh) for its graduates on 21st Jan, 2019. The drive was organized for recruitment in multiple career options. Around 130 students of BCA, B.Sc. (Non-Medical, IT, Computer Science, Economics), B.Com, BBA and BA participated in the drive. Ms. Ankita Sinha, HR Analyst of Concentrix conducted the event. Ms. Ankita Sinha made a presentation about the company, career opportunities in concentrix and salary packages. This was followed by HR Round, Voice and Accent Round, Multiple Choice Assessment of logical reasoning and computer skills. Finally, 87 students got selected. With the blessing of Principal Dr. Pushpinder Walia and the sincere efforts of Mr. Manoj Puri, Dean Placements and his team such a large number of recruitment was made possible.